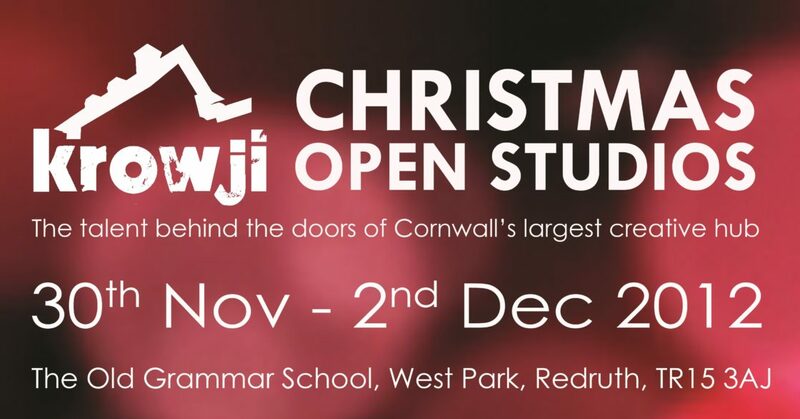 In 2012 Krowji was home to over 50 artists and designer makers, many of whom took part in Christmas Open Studios, which ran from Friday 30th November-2nd December. In 2012 work produced at Krowji could be found in shops and galleries throughout Cornwall and beyond. Otter Surfboards had just completed a board for the National Trust and were exhibiting at the Patagonia shop in Covent Garden until the end of February 2013. Artist and illustrator Valerie Mainwaring had been approached by W.H. Smith who wished to use two of her paintings for jigsaws. Following the success of “Florence Flies Away” illustrator Esther Connon had been working with R Booth Print in Penryn to produce a brand new limited edition of 250 litho print picture books. Christmas Open Studios 2012 launched on Friday 30th November from 6-9 p.m. with an evening of free mince pies, mulled wine and mulled apple juice, and a special performance by the Ingleheart Singers. The event continued on Saturday 1st and Sunday 2nd December from 10 a.m. – 5 p.m. each day. As well as visiting the studios there was an opportunity to do some Christmas shopping and buy unique gifts hand-made in Cornwall which showcased the remarkable talent held within the creative community at Krowji. On the Saturday Colour Monkeys ran free Christmas art workshops for children aged 4-10 years, providing creative entertainment for energetic offspring and the perfect excuse for parents to treat themselves to a spot of peaceful Christmas shopping in the inspirational surroundings of Krowji studios. Father Christmas was in his grotto throughout the weekend welcoming children in to share their wishes and the Melting Pot Café will be open throughout the weekend serving a range of irresistible food and drinks guaranteed to recharge your batteries ready for more retail therapy! 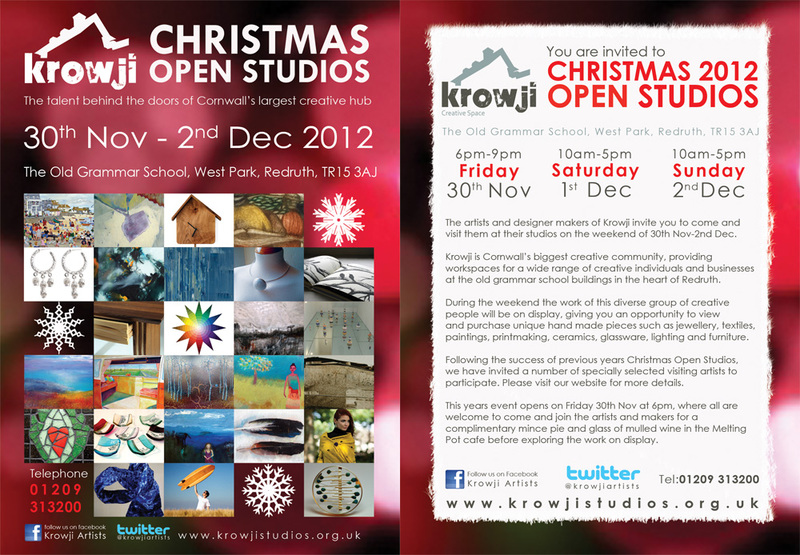 At Christmas Open Studios 2012, 38 Krowji artists opened their doors for the event. An incredible 14 new artists joined the event, including Miracle Theatre and Lou Johns. 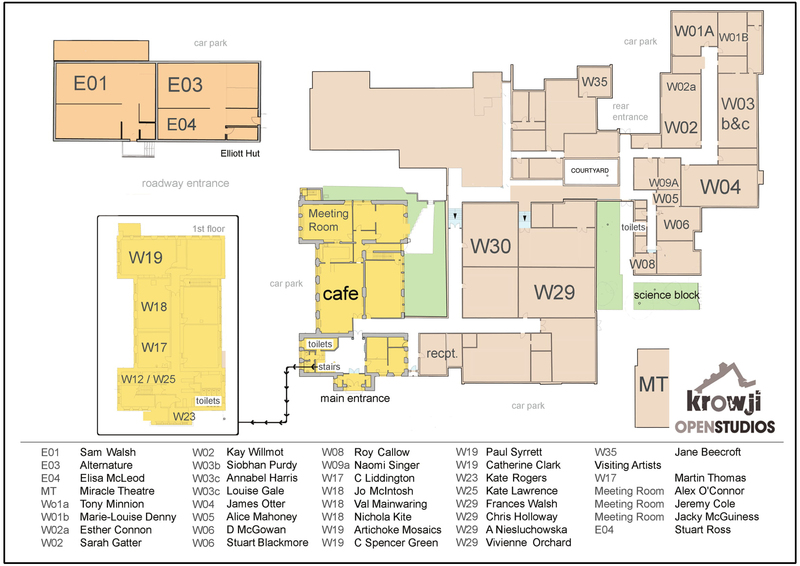 Stay up to date with the most recent Open Studios events at Krowji by checking our event page.